Join us for a tour of the LEED registered Embassy Suites St. Louis – Downtown and Laurel Apartments! The evening will begin with complimentary Pi pizza, followed by a brief overview of the project deliveredby developer Amos Harris, and conclude with tours of the building led by members of the project team. 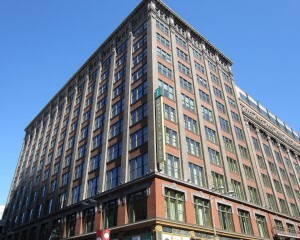 Built in two phases in 1906 and 1919 as the Grand Leader Department Store, the building covers an entire city block along St. Louis’ Washington Avenue corridor. After nearly a century of use as a major headquarters and retail destination, the building sat vacant for a decade before being completely renovated and converted into an urban mixed-use facility with 205 residential apartments and 212 hotel guestrooms. Over 95% of the building’s walls, floors, and roof were incorporated into the renovation, including the courtyard and stairs installed in the 1980’s renovation as part of the St. Louis Center Mall. However the renovation removed one key element of the mall conversion, the 3-story connector bridge over Washington Ave., restoring the prominence of the streetscape and urban corridor. Being in the heart of downtown St. Louis, the building, renamed as The Laurel, is particularly well suited as a mixed-use renovation. The adjacent MX development and the other development downtown creates a truly walkable neighborhood with access to employment, shopping, services, and entertainment, while the project provides public transportation access at nearly sixteen times the threshold set by LEED. Other elements of a comprehensive transportation management plan include bicycle storage with access to bicycle route maps accessed through mobile devices, enhanced pedestrian elements in the streetscape, a car share program, and an on-site electric vehicle charging station. The renovation of The Laurel has attempted to create a more sustainable building by improving the building envelope with additional insulation, new low-e insulated glazing, and a white roof to reduce the urban heat island effect. Given the size and perimeter length of the building, the water loop serving individual heat pumps at each apartment or guestroom will efficiently transfer heat from areas requiring cooling to areas requiring heating. Since the initial construction was at the turn of the last century, the renovation included extensive hazardous materials abatement through brownfield tax credits, and the new construction has attempted to keep this clean indoor environment with low-VOC paint and flooring systems, an exhaust system with pressurized corridors, and operable windows. Hidden efforts to increase sustainability include high recycled content structural steel, light gauge metal framing and gypsum board systems, low-flow toilet and other plumbing fixtures, and refrigerant systems with low ozone depletion potential. Traveling via Metrolink is encouraged; the building is located near the Convention Center Metrolink Stop. If driving, parking will be available for a discounted rate of $2/car at the 7th & St. Charles St. Louis Parking garage (Entrance and exit is on the 7th street side.) Cash or credit card will be accepted; discount passes for parking will be available at the event registration table. Click here and then click on the “Register” button on the left side of that page. We invite you to join East-West Gateway Council of Governments, FOCUS St. Louis, and 10 other regional partners in an effort to coordinate housing, transportation, environmental and economic development planning across the St. Louis Metropolitan Area. This effort will envision a better future for St. Louis that is sustainable, equitable, and livable. Part of this regional planning process focuses on eleven Community Planning Areas (CPAs) selected as representative communities across our region. This is the second round of a year-long engagement process that includes four meetings in each CPA. Our success relies on robust citizen participation. We encourage residents, business owners, and public leaders in these communities to attend Round 2 to provide feedback and participate in discussions on the ideas that emerged from Round 1. Click here for more information on meetings in your area. Click here for more updates on the Regional Plan for Sustainable Development (RPSD). Why is it important for the St. Louis area to have office space that’s certified as energy- or water-efficient? What’s the biggest challenge in achieving the goal that’s been laid out? What some common types of projects undertaken to make office space more energy efficient? How quick is payback for building owners? Beside solar panels, what kind of work has Microgrid done at Busch Stadium to make it more efficient? Free for USGBC-Missouri Gateway and ASHRAE-St. Louis Members as well as Full-time Students; $20 for Non-members. Check out the St. Louis Beacon article about our DIY Sustainability event held on June 12th! The event was very successful with 6 unique presentations and over 120 attendees. Presenters talked about how individuals can perform a home energy audit, install a green roof, convert any kind of car into an electric car, grow/harvest tilapia in their garage using aquaponics, resuse/upcycle old wood into wonderful furniture, and how to have the most fun and success when dumpster diving in St. Louis! Many thanks to our wonderful presenters, to Pizzo & Associates, Ltd. for sponsoring the event, as well as to St. Louis Green and St. Louis Earth Day for partnering with us for this event! In response to overwhelming feedback from USGBC members, core LEED users and engaged stakeholders, the LEED 2012 ballot will be delayed until June 1, 2013. Because of this date change LEED 2012 is being renamed LEED v4. This change is 100% in response to helping stakeholders fully understand and embrace the next big step for LEED. USGBC plans to do everything they can to ensure that the market is ready for LEED v4 because it represents progress on both carbon reduction and human health improvements. For more information, read the letter from Rick Fedrizzi, President, CEO & Founding Chairman of U.S. Green Building Council.